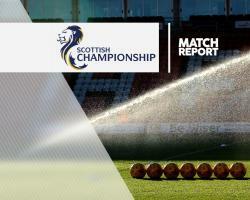 In-form St Mirren climbed off the foot of the Ladbrokes Championship despite being held 1-1 at home by Dumbarton. The striker cut inside and dispatched clinically after being set up by Cammy Smith in the 10th minute. Home defender Adam Eckersley was shown a red card in the closing stages after picking up a second booking, but it came too late on to adversely affect the Saints' cause.